The Bad Kitty Bakery: Sushi Salad with RECIPE!! Sometimes I feel like sushi, but without the work. I mean, it can be difficult for me to everything properly with my lifestyle and having a few minutes to eat. This salad is my solution for when I am craving sushi, but I want it now. Best of all, it looks impressive so you can serve this to guests and they will never know this was the quick alternative to making all those rolls! By the way, I like a lot of soy sauce. A lot. Seriously. I have made my husband stare at me while I down food in the stuff. If you are not like me, cut the soy sauce in this recipe by half. Also, if you can track down real wasabi powder you will not believe the difference! It is sweet, mild and wonderful. If not, use the American ‘wasabi’ and enjoy, because this salad still kicks. Also, vary the ingredients based on what you eat in your vegan sushi. I had these items around my house, but you can use carrot sticks, different sprouts, sprinkle it all with sesame seeds… the possibilities are endless! On a plate, lay out your nori strips. On top, place your rice. I molded mine in a measuring cup. Then dice your daikon, and sprinkle around the base. 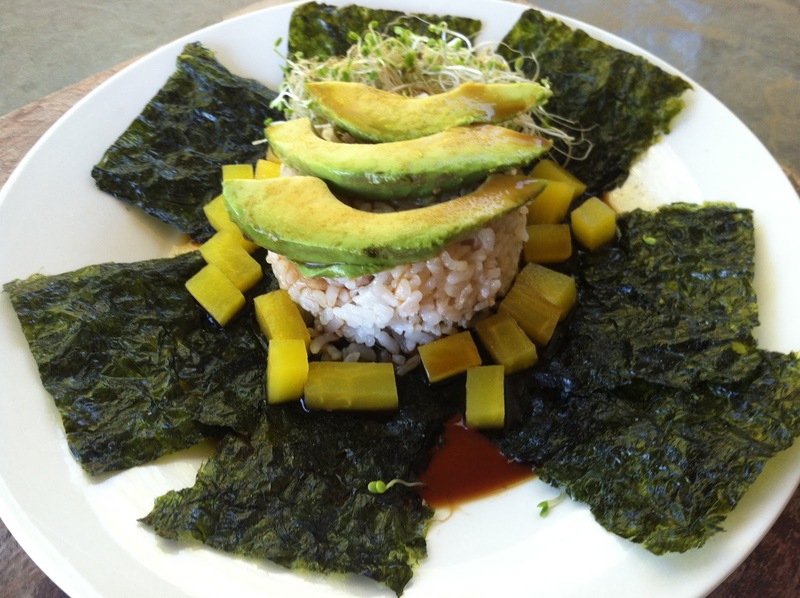 Place your avocado on top of the rice. Lastly, place your sprouts on top of the avocado or on the side. In a small bowl or cup whisk together all your dressing together, then pour over your rice stack. Serve immediately, because the nori will start to get soft.